A class may provide a method definition for an instance method named dealloc. This method will be called after the final release of the object but before it is deallocated or any of its instance variables are destroyed. The superclass’s implementation of dealloc will be called automatically when the method returns. The instance variables for an ARC-compiled class will be destroyed at some point after control enters the dealloc method for the root class of the class. The ordering of the destruction of instance variables is unspecified, both within a single class and between subclasses and superclasses. // Call cls's dtor first, then superclasses's dtors. 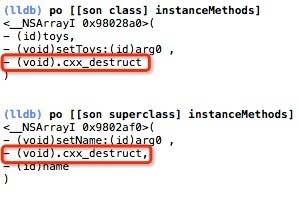 ARC actually creates a -.cxx_destruct method to handle freeing instance variables. This method was originally created for calling C++ destructors automatically when an object was destroyed. 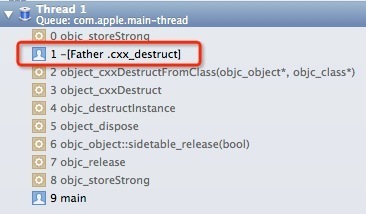 When the compiler saw that an object contained C++ objects, it would generate a method called .cxx_destruct. ARC piggybacks on this method and emits the required cleanup code within it. // Check whether the ivar is a destructible type. // general benefit of the tools. // Otherwise use the default for the destruction kind. // Call [super dealloc] if we have a superclass.